Yesterday, we celebrated Christmas, the birth of Our Lord and Saviour Jesus Christ. We contemplated the newly born baby Jesus lying in a stable manager, we sang carols, feasted, and heard the tidings of peace and joy for the whole world. Although we are still very much in a festive mood, with the carols still ringing in our ears and the feasting still bloating us, today’s Feast of St Stephen the first Martyr, is a stark contrast to that of yesterday, but there is indeed a true deep link between the birth of Our Lord Jesus and Today’s Feast of martyrdom. We all too easily forget among all the joyous festivities of Christmas, that our Lord Jesus was born amongst us, into a hard, cold, and violent world. Our dear Lord Jesus, the Son of God, was born not in a fancy palace or building. No, of all places,he was born in a manger within a simple stable. Not long after his birth, King Herod was looking to have him killed. This was only the very beginning of the violence and persecution which our Lord Jesus was going to face in his life upon the earth, and this would ultimately lead to to his execution upon the cross, paying the ultimate price for our sins and to gain for us eternal life and salvation. 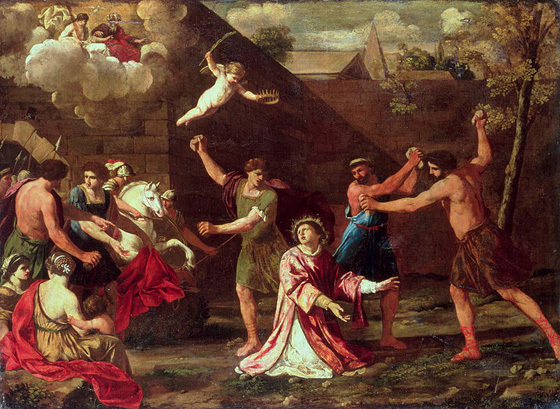 So, when we truly reflect upon both the joy of Christmas and Today’s martyrdom of St Stephen, we can see the deep connection between the divine love and tenderness and human violence and persecution. Our Lord Jesus Christ came to heal our human hate and violence with his divine tenderness and love for us. This was expressed in mercy and by Forgiveness, this was also witnessed to us by the martyrdom of St Stephen. Just as Stephen believed and showed to us, let us also believe the truth, that ugliness and the evil of human hate and violence can only truly be changed with the divine tenderness of love and Forgiveness. It is only through God’s mercy, love and Forgiveness and of our showing it as servants of our Lord Jesus Christ, just as St Stephen did, that hardened hearts will be turned into loving hearts.